If you have a double door you will need to order two handlesets. One for the active side and one for the inactive side. 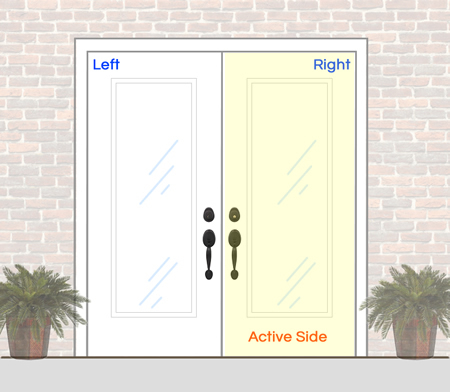 HANDLESETS ARE NOT SOLD AS PAIRS for double doors. 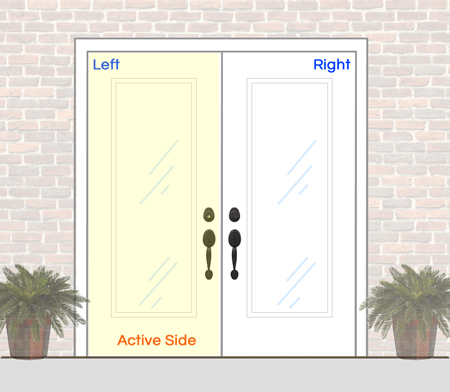 Compare your doors to the images below for instructions on what to order. Step 1: Choose handleset style you like and add 1 LEFT HAND single cylinder handleset to your cart. Step 2: Once the item is added to your cart, click continue shopping and you'll go back the same handleset page. Step 3: Now Select Options for 1 RIGHT HAND Dummy function handleset and add to your cart. Step 1: Choose handleset style you like and add 1 RIGHT HAND single cylinder handleset to your cart. Step 3: Now Select Options for 1 LEFT HAND Dummy function handleset and add to your cart. Note: Dummy handlesets are essentially identical as active sets in the way that they are made. They have all of the same hardware except latches so they typically cost the same or just a little bit less than Single Cylinder Sets.